I’d do every bit of it again, as long as I could do it with you. DITTO. I am blessed among all men to have you for my bride. Thirteen years is just the beginning……. Congratulations – it’s great to see that people can survive the CFA! Plagiarized. Sorry. Shannon is certainly the grammarian in the family! Congratulations on your anniversary! 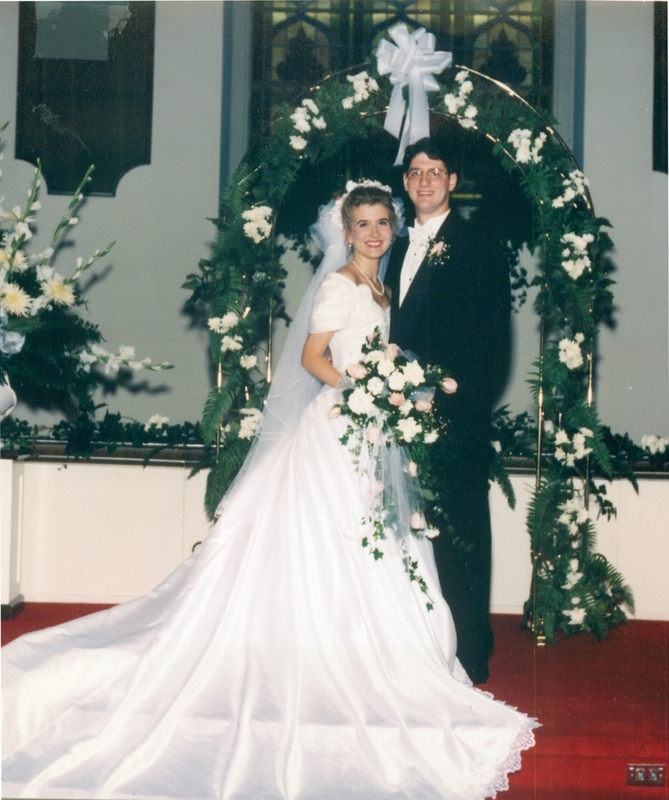 Love the dress…Blessings on many more years together. Congratulations! Wishing for you many, many happy years ahead. Congratulations on 13 years! I love the picture. Happy Anniversary! Many blessed happy returns of the day to you and Hubs Dryer. WOW! who are those young kids?! Congrats! & I love the ‘Ghost’ plagiarism! Happy anniversary! I laughed at toe-lint cleaning, because my husband like me to clean his. Funny! Today is my 13th anniversary, too! And my husband has done/put up with most of your list with me, too. Awesome! I just posted an anniversary tribute too – mine was Saturday. Love the picture!!! Isn’t it fun? Congratulations! What a stunning dress you wore, and what a lovely photo! Best wishes for the nest 13 too! And more…..
Love the picture! Happy Anniversary! Point of clarification, we do NOT clean each others toe lint. Um, ewwwww. Happy Anniversary! We just celebrated 17 on Saturday!!! June is such a good month! Congrats on 13 years!! We’ve been married for 3 years this month! I hope we can still be as happy as you are 10 years from now!! Aw, happy anniversary! Beautiful picture. What a lovely bride! Happy Anniversary, Shannon and Hubs. We’re celebrating a milestone this month, too. DP turns 40 on Thursday . . .aughh. Lucky 13 for us this year, too. It’ll be 14 in Dec.
We celebrate 22 years on the 29. A wonderful Happy 13th anniversary to you!! We’re not far behind celebrating ours next month!! What a fun post in celebration! Yay! 13 years! I love how you are so sweet to your husband in your blog. It just makes me smile to read about how much you love each other. I’m new to blogging and just started reading yours around the time you guys went away together. You’re too cute. Congratulations! But don’t you have to place a dash between each of those nouns/verbs turned adjectives? 😉 Happy belated anniversary. And yes, that is a fantastic picture. Congrats and what a lovely photo! Hey, Shannon, just reading through some of your posts. Our anniv. is this Friday – 16 years. You’re right behind us. You’ll notice in Paul’s book that he’s coached soccer for years — I just saw your “soccer coaching” listed on this post. Do you coach or your hubby? Happy, happy Anniversary! You were a lovely bride! May you have many years of joy and laughter! What a fabulous list… and what a wonderful year 1994 was for weddings! We celebrated our lucky 13th just a few months ago. Happy anniversary (and many more) to the two of you. What a horrible week to be out from blogging! It’s late, but it’s still from my heart: Happy Anniversary to the two of you! May you have decades more fun to come!